Santa Claus isn’t the only one with a special delivery this December. LaSonia Melvin of Wilmington’s Union Missionary Baptist Church is also responsible for a big trip with an important mission. But instead of a sleigh flying around the world, she coordinated a special tractor trailer transport to our Raleigh Branch to pick up more than 12,000 meals for her community. Even though Union Missionary Baptist Church is located close to downtown Wilmington, the nearest grocery store is more than 2 miles away. That officially qualifies as a food desert. The majority of Union Missionary Baptist Church’s parishioners live in the food desert too, which makes it challenging to keep their home stocked with food – let alone healthy produce. That’s why they joined Food Bank CENC’s partner agency network and began Abundant Giving Food Distributions. The good news is that the Food Bank’s Raleigh Branch recently moved into a new facility with three times more space for perishable foods, such as fruits and vegetables! And with the holidays approaching, LaSonia wanted to make sure that every family served by the Abundant Giving Food Distributions had enough to eat. So she recruited her friend and independent trucker James Mcduffie, who gladly volunteered his driving time and the truck he owns to the cause. 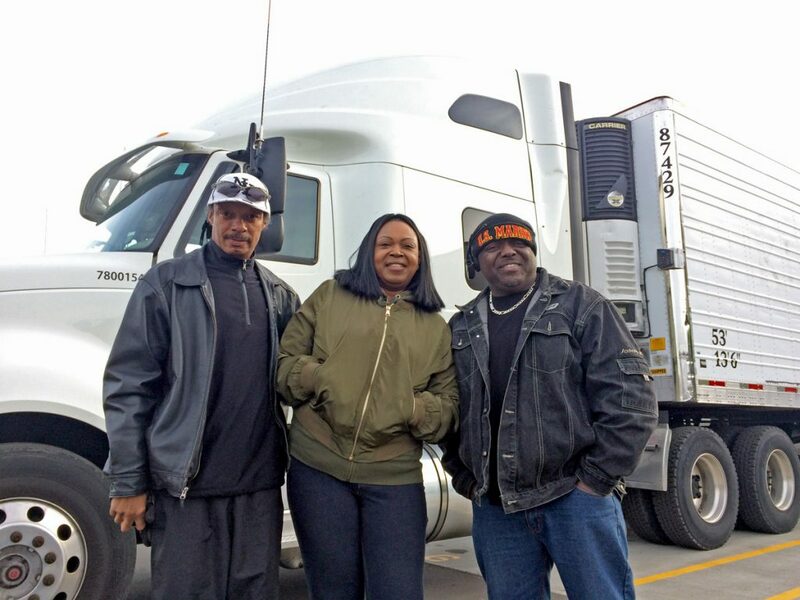 Steven James, LaSonia Melvin, and James Mcduffie traveled to Raleigh on a cold morning, to truck back thousands of meals of produce for their Wilmington area community – just in time for the Holidays! Of course, 18-wheelers don’t run on reindeer magic. The cost of diesel fuel for this trip is being covered by funds from Union Missionary Baptist Church, Warner Temple, and St Paul’s AME Zion Church – who will also help distribute some of the food to Hurricane Matthew victims in Columbus County. From the food sourcing, to the trucking, to the volunteers who helped with the distribution, this team effort brought cabbage, collards, green peppers, tomatoes, sweet potatoes, yogurt, macaroni salad and potato salad to over 300 local families in need, and made the holidays a little brighter for everyone involved. Stories like this warm our hearts – but they would not be possible without your support. Donate here to keep our shelves and coolers stocked with food for those who need it.